Institutions must engage deeply with their student veterans in order to become the university of choice for future veteran students looking for postsecondary opportunities. As the face of academia changes with the increase of student veterans returning to school, institutions face a challenge that was last addressed after World War II. How can an institution ensure the success of both their traditional and non-traditional students? While there are certainly a multitude of answers to this particular question, this article will focus on one of the ways institutions can act as assets in the integration of their student veteran populations. In order to establish an environment that encourages student veteran academic success, institutions can begin to identify those services and agencies that best address this concern. 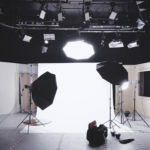 Many institutions already have these help agencies and it’s a matter of leveraging those services to address a specific set of the student body. Of the requests made to my veterans regarding enrollment in universities, 62 percent of respondents identified veteran student services provided by the university as the greatest informational need. This outweighed the acceptance of credits earned during military service (50 percent), estimated student loan debt upon graduation (40 percent) and graduation rates (40 percent). The institutions that can address the specific need and support desired by veterans will be positioned to better recruit, retain, integrate and matriculate student veterans. By establishing a three-facet approach to veteran student services, institutions will become the university of choice for veterans returning to higher education. Student veteran integration models will vary among institutions. However, the cornerstone for any success should be based on dialogue and mentorship. Using a three-facet approach, the institution develops a diversified campus footprint in its student body, and in the larger context of dialogue among varying viewpoints. First, establishing a veteran student services office allows for the institution to link those services that it provides to a ‘one-stop shop’ for student veterans. Additionally, this institutional focus creates an environment a student veteran will feel more comfortable in. While this may seem redundant, it in fact acts as the first step in a long-term integration process. Within the veteran student service office model are three subsets. First, the director, who as a member of the staff, is able to address student veteran concerns and success stories at the highest levels of administration. Second, an ombudsman, whose primary focus is integrating the student veteran with the help agencies available on campus. Third, and perhaps most crucial to the success of student veterans, is the establishment of a student-led veteran organization. The primary focus for this group is peer support and mentorship. These three capabilities, working in concert, create the atmosphere in which academic success is most readily achieved. With a veteran student service office created, institutions are then able to create long-term success for their student veteran population. The ultimate goal for any student is to graduate. This goal also means the former student is now an alumnus. 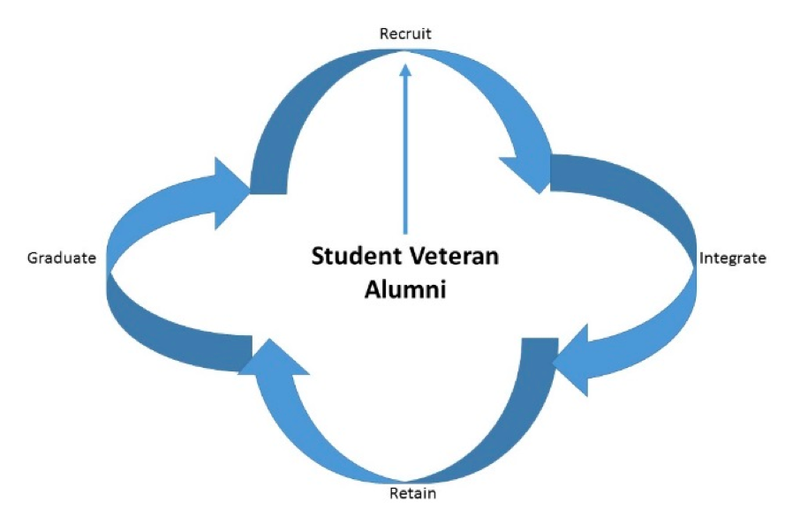 By identifying this as a crucial step in the integration process, institutions will reap the benefit of academically successful student veterans, who will recruit fellow veterans to their institution due to the positive environment and outcome of their educational plan (mapped out in Figure 1). As members of the military begin to return to the classroom, the opportunity for colleges and universities to act as positive agents in the successful integration of veterans into the university has never been greater. Many of those returning to school are seeking to better themselves, and are focused on their goals. By identifying their needs and addressing them, institutions will find a student who is willing to work hard, is able to adapt to differing circumstances and will enhance the diversity of thought on the campus. I like the idea of focusing on improving the veteran student experience. Lanier is right: if we create an unforgettable, highly-supprotive environment for veterans, word of mouth will win. The problem is competing with the for-profits. They have so much literature and marketing dedicated to their “best veteran institution” status that it’s almost impossible to think that word of mouth can overcome it. 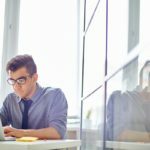 Serving student veterans is about more than having a staff person or office labeled with the term “veterans” and hoping it will meet their unique needs. Unfortunately, many institutions seem to have taken this route when dealing with their student veteran populations. Thought has to be given at all levels of the institution, and in all processes (from enrollment to scheduling to extracurricular supports) on how to design a veteran-friendly system. You have hit the nail on the head. The issue of helping integrate student veterans into the campus must be one made at the institutional level. Unfortunately, being ‘military friendly’ or any other title is only as good as the services provided. Interesting points Lanier has raised about serving student veterans. One challenge I see is that this group of students may not always identify as such, or they may not make up a sizeable population on campus (which is usually the prerequisite to the institution taking action on addressing their needs). This means there’s a need for all institutions to introduce veteran-friendly policies and practices, regardless of whether they have three or 3,000 student veterans on campus. That awareness of institutional responsibility, that culture change, is still absent across many campuses. Thank you all for the comments. These are the discussions that are necessary to identify those gaps that may exist.